The dance program is relatively structured and integrated to ensure optimal development, especially for those few students able to continue into professional dance. Fundamentals in classical ballet training are the cornerstone of the program. Jazz and Tap are supplements to help promote musicality, rhythm and to maintain interest level over the developmental years. Classes are divided into various levels with increased emphasis on technique and execution. It is a very exacting form of dance training tha makes the body exceptionally strong, lithe and coordinated. Ballet builds grace, strength and flexibiltiy through sound mechanical development providing a physical base useful in any other type of dance or coordinated athletic endeavor. Traditional standards of classical ballet are taught with individualized guidance provided to allow students to derive the most from their lessons. A special form of ballet training only allowed after a certain level of technical expertise is achieved in classical ballet and individualized physical maturity capable of supporting its requirements are met. Minimum age is 10 years, although careful attention is paid to variances in individual development. Requires many of the same kinds of strengths and flexibiltiy that ballet does, but moves the body in many non-traditional ways. We bring these dance expressions to life by using popular music and evolving the repertoire of steps with the current trends. It is recommended students take Jazz after having some ballet training to give them another perspective of dance. Jazz allows a greater freedom of movement and is a good outlet for creative expression and energy. Beginner and advanced classes are available. These classes provide enjoyable forms of exercise, promote flexibility and fitness. An annual recital is conducted to provide students with a performance vehicle. The recital is a big affair generating enormous amounts of excitement and anticipation. Students gain valuable stage experience from an early age and parents pick up some wonderful memories. 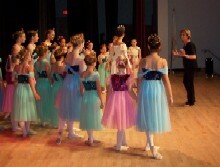 The annual recital is usually in June marking the culmination of the dance year. Participation is optional at the parents discretion. Guest visitors include specialty area experts and professional dancers.